Happy Thursday Everybody! Not long until the weekend now for all you lucky people who get weekends off, unfortunately for me im working tomorrow & saturday! 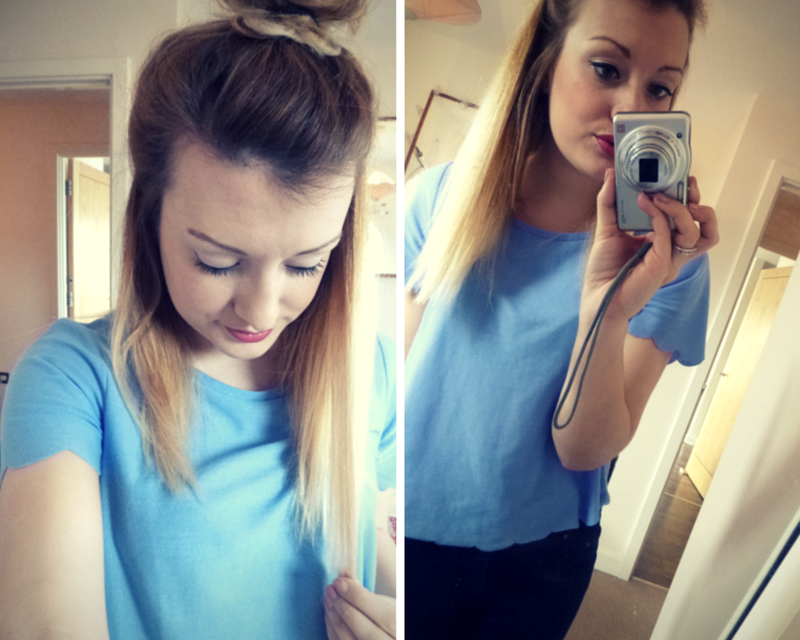 So today i thought i would do a hair related post as i actually dont think i have done one before! I am absolutely obsessed with my ombre hair, I have struggled with my hair for years.. i have a serious 'hair fear' (i like to call it) which means i am absolutely terrified of anybody new getting their mits on my hair and doing anything to it! In the past i have had a few hair disasters which have involved inches being chopped off when i didnt want that to happen & fringes cut in which made me look about 7 again! So now i have a hair style i actually love I do the best i can to take care of it! Continue to Read below if you want to know any tips for how i look after my hair as best i can and maintain the ombre! OK, firstly the key to 'maintaining' an ombre is actually getting it died regularly and having your hair cut at the hair dressers. I make sure that i get my hair cut and died at least once every 10 weeks (or at least until the regrowth looks like its desperate). I get my hair done by an AMAZING hair dresser called Ashley at a Spa in my hometown and i swear i could not recommend anybody more. Everytime i get my hair done it costs me £50 which is AMAZING. Ashley maintains my ombre by firstly placing any highlights through the hair (if i want to change the colour of the blonde slightly) but sometimes she will just dye the bottom with some conditioner mixed with a small amount of blonde dye (if it just needs brightening up a little bit). Once the blonde dye has been popped on she then dyes the top using a colour i choose (at the moment i am experimenting and trying to achieve a lighter ombre so going for a lighter brown on the top, this is done just rubbing in the dye with a brush and ensuring its thoroughly rubbed in to the roots of my hair. I always get just enough cut off as well as in the past ive left it for ages and ended up getting inches cut off because it was so dead!! I think its the key to blonde too, it needs a regular cut because blonde gets SO dry!! SO.. inbetween hair appointments its very important i treat my hair right at home. Obviously a key thing is to wash my hair regularly to give it a good shine. Everytime i dry my hair i also use Moroccan argon oil which adds extra shine softness to my hair! Whenever i dont use argon oil my hair feels so rough, so its become a religious part of my routine to ensure i use it everytime i dry my hair!! Another thing i ensure i do at least once a week is to pop a conditioning hair treatment on. 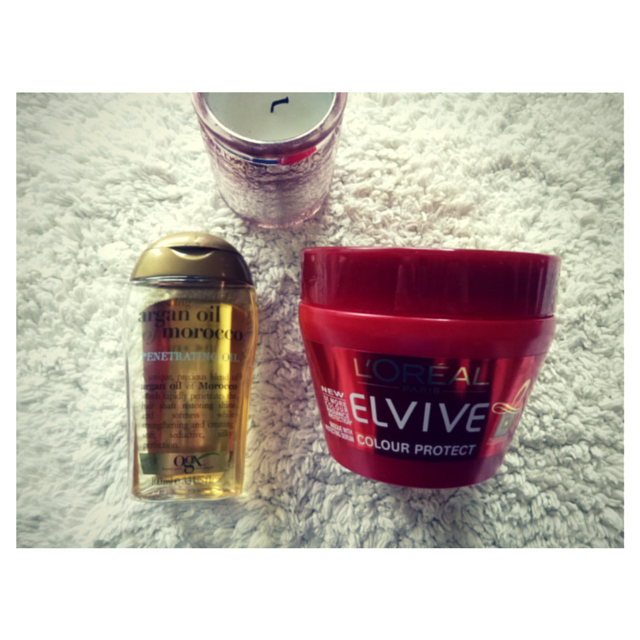 As you can see from the above photo i am using the loreal elvive colour protect leave in conditioner/masque. I actually only bought this to try out.. and didnt think it would be too good, but ive had it for months now and swear by it! It makes my hair feel amazing after ive used it! You dont need very much of this when you use it either so it lasts ages! What i do with this is lather the ends of my hair with the product and rub it in, i then leave it on my hair for a good 3/4 minutes before washing it off and honestly you can feel the effects straight after! 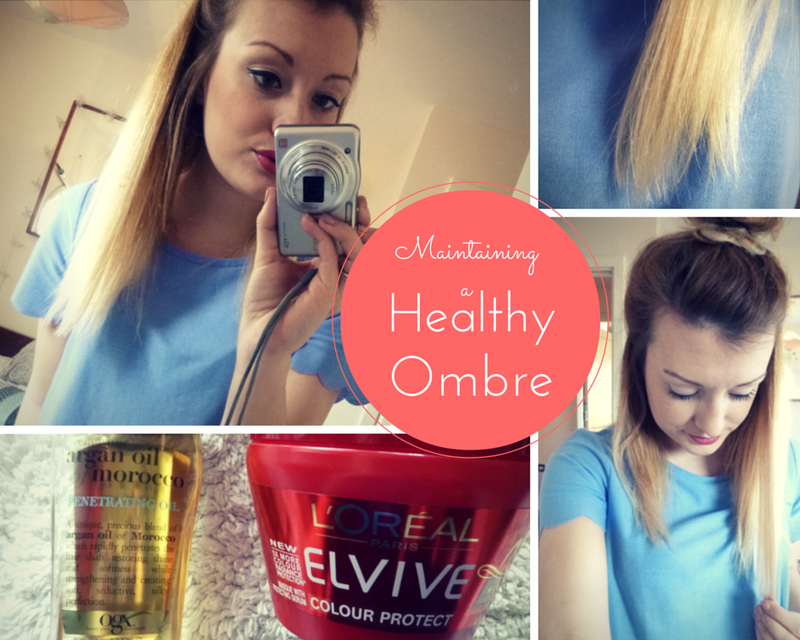 So yeah, thats how i maintain my healthy ombre! I dont use expensive products to make it feel silky.. just the products i have mentioned above!! I would truly recommend these to anyone who had blonde hair or ombre because it works and they are also super affordable! Let me know in the comments below or over on my instagram 'whatlaurenlovess' if you have any products you highly recommend for blonde hair or ombre!